1. A refund may be available at the discretion of the company management. 2. Alethea Simpson Photography retains the copyright on all photographs taken and supplied. Photographs may not be copied, published or reproduced in any form without the written permission of Alethea Simpson Photography. 3. Please allow 28 working days for delivery and for Christmas deliveries, please ensure you send your order before 20th November. 4. This contract between us shall be governed by and interpreted in accordance with English Law and the English courts shall have jurisdiction to resolve any dispute between us. 5. The prices of products are stated on this web site and are inclusive of VAT. The prices are subject to change without notice. 6. We are unable to accept liability for any incorrect information supplied to us by you the customer. 7. We cannot guarantee that we will be holding stock of the products displayed on this web site. Any non-stock items will be despatched as soon as we receive them from our suppliers. This may take longer than 28 days. 8. If you receive damaged or unsuitable goods you may return the products within 30 days and we will replace them or refund the item. We will process these returns as soon as we are able. We will not accept returns or refunds for products which are of a reasonable quality. 9. Any photographic item will fade over time. This is accelerated if the product or print is exposed to direct sunlight. We cannot accept responsibility for this fading. 10. Colour and designs may vary from illustration. The photographer will keep confidential and will not disclose to any third parties or make use of information communicated to them in confidence for the purposes of the photography, save as may be reasonably necessary to enable the photographer to carry out their obligations in relation to the commission. 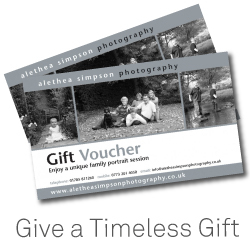 Treat your family members to a unique portrait session with a special gift voucher. Please get in touch for more details. 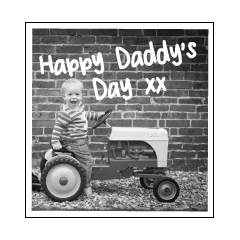 Surprise dad with a timeless image of his little angels!! Please get in touch for more details.